The teachers held a symbolic crucifixion to highlight the difficulties they are facing. 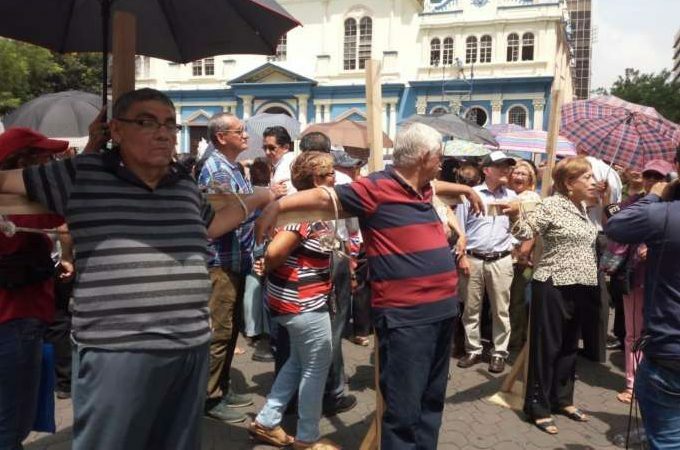 On April 3, more than 100 retired teachers protested at the San Francisco plaza in Guayaquil city in Ecuador, demanding that the government pay their pensions. The teachers said they had not received their pensions since 2008. Some of the teachers held a symbolic crucifixion to demonstrate the hardship they go through when they do not receive the corresponding amount. The protesters condemned the government for pushing them to take to the streets in their old age, with many of them suffering from illnesses. Manuel Antón, the president of the Provincial Coordinator of Retired Teachers in Guayas, pointed out that the State owes each teacher between USD 18,000 and 53,000. Aracely Moreno, the former president of the Educators National Union (UNE), pointed out that the government is indebted to some 21,000 teachers, of whom around 600 have died without receiving their pensions. Last year, in January, the National Assembly with 119 votes in favor, ratified the Interpretative Law to the Ninth General Provision of the Intercultural Education Law, which recognizes this incentive for those retired between 2008 and 2010. Richard Ramírez, president of the Coordinator of the Retired and Pensioners Teachers of Ecuador, said that the mobilizations would be organized in the capital if their demands are not heard. The protesters also warned that they might go on hunger strike to demand their rights. Hey Buddy!, I found this information for you: "Retired Ecuadorian teachers condemn lack of pensions since 2008". Here is the website link: https://peoplesdispatch.org/2019/04/07/retired-ecuadorian-teachers-condemn-lack-of-pensions-since-2008/. Thank you.